"Nice one, loving the snook remix!!" "Very nice stuff! Loving Snook remix the most. Wicked bass and groove, this will fit into my sets perfectly. Support! " "Nice, another strong release from Logariddim. All threre tracks are good, but Snook remix here stands out for me. Love his psybreaks style and is definitely one to keep eye out for. 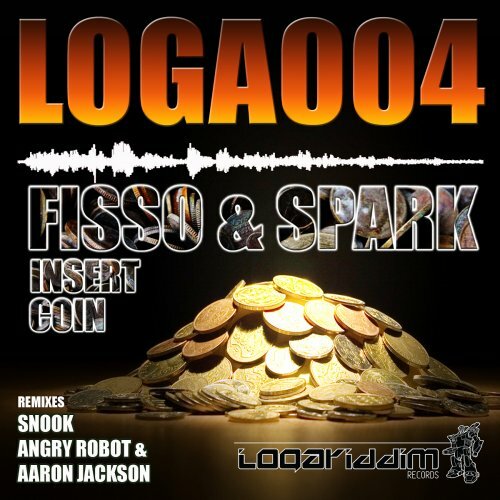 Angry Robot and Aaron Jackson remix is also amazing but quite different, and it sounds like it would smash the dancefloor if dropped at a right moment. Im definitely gonna be spinning these." Fisso & Spark, the well known Austrian/Italien Duo, give their debut on Logariddim with a chunky Tech-Funk Trucker called “Insert Coin”. This track is a brilliant piece of banging beats combined with sharp Synthriffs and a stomping bassline. To make a long story short, “Insert Coin” is BIG and ready to mash up some dancefloors. Fisso & Spark have been nominated as "Best New Breaks Producers" in 2012 Breakspoll International Awards. We are very happy to welcome John SNOOK on board. His interpretation of “Insert Coin” takes us on a journey through space and time, alongside hypnotizing basslines and shiny atmospheres. SNOOK takes elements from different genres of music and fuse them together creating a sound that people from all walks of life could feel or relate to in some way. Angry Robot is the brand new side project of US psytrance artist Krysalis Moon better known as “Smoke Sign”. He has teamed up with his sidekick Aaron Jackson to deliver us their very first psybreaks track. Their remix of “Insert Coin” is a firework of creativity assisted by cutting edge Effects and playful synthesizer work. This is definitely a project to keep an eye on! We at Logariddim HQ are proud to offer them a platform to release their first remix.